With approximately 12 million single-parent families in the US--most of them run by single moms--they need some understanding! Too often single moms are asked inappropriate questions, nudged into blind dates, and generally hear all sorts of nutty things that make them tired. Whether you're a single mom or want to know how to support them, read on! Sure, being a single mom isn't always ideal, but even with the difficulties of being the only one around to take care of the kids, we are actually quite happy. Without another adult around, we always get to make the decisions and don't have to worry about stepping on anyone's toes. We may not have as much free time with our kids, but the free time we have doesn't need to be a compromise between two grown-ups. Don't overdo it, but from time to time, check in with us to see if we need help. 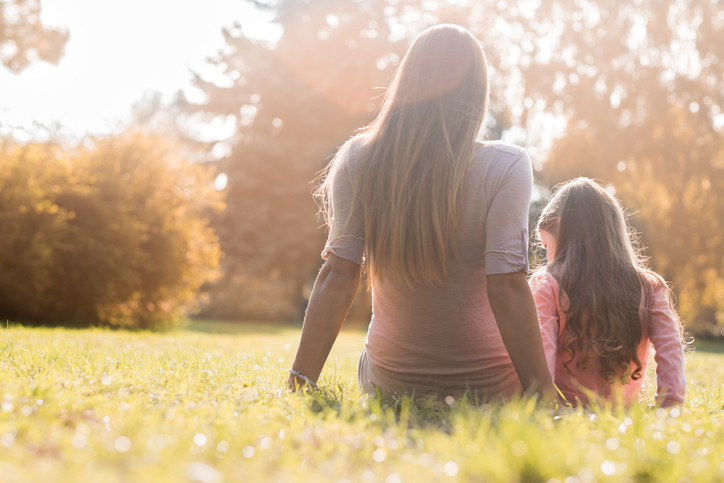 We don't get a lot of time by ourselves—and seriously, we might just want to stay home and take a nap while you take the kids for a trip to the park—so if you can offer to watch the kids for a little while, a break would be nice. Also, if you have any hand-me-downs in good shape, we'd love them. We don't want our children to have to repeatedly explain why they only have one parent. It's not their fault and they shouldn't have to feel bad or different. If you open a dialogue with your kids about the fact that some kids only have one parent, or some have two parents of the same gender, then it won't be an issue for anyone when it comes up. We would love to go out for dinner and drinks this Friday—but we can't. Even if we do get financial help with our kids, it's expensive raising children and there isn't a lot of money to go around for outings like that. Also, it's not always easy to find a babysitter we trust and can afford. Don't stop asking us though—some day we'll be able to say yes. Yes, we're single, and honestly, it's not so bad. Sure, it's lonely sometimes, but that doesn't mean that every time you meet an eligible bachelor we want you to set us up. Dating is difficult enough as it is without having young children involved. If he's a spectacular catch and you think we're perfect for each other, then give me his email address, but for the most part, no blind dates, please! Unless we lost our spouse in a tragedy, don’t assume that we should have stayed together for the kids. We don't broadcast every aspect of why our relationship didn't work, so unless you want to really tick us off, don't tell us you think we should try to work it out. Our kids are happy, and we are, too. We get it—being alone with your children 24/7 can be overwhelming sometimes—but you know there's an end in sight, and you're probably not the sole income. If you want to commiserate, we'll try to listen, but don't complain about your situation too much, because you're basically telling me that my life is awful. Not cool. Don't Say, "I Don't Know How You Do It!" If you're a parent, you know how we do it—one step at a time, as each situation comes up—just like you. What looks like an impossible task to you is our regular day. We do it because we love our kids, and because we have to. It's not as bad as you think. We don't always have the benefit of a partner who can tell us great stories about something our kid said or did, and we don't have anyone giving us feedback on how things are going. We know how cute, funny, polite, and smart our kids are, but we still need to hear it. A compliment about our kids can make our hearts leap and give us something wonderful to think about during the harder times. Sometimes we just need to know that somebody else thinks we're doing a great job. When it comes to being a parent, nobody really knows exactly what they're doing—we all basically make it up as we go along—so it helps to hear that we're not doing so bad after all.